Signed and dated l.l. "Penleigh Boyd 1919". Hendrik Kolenberg, Look , 'The art of Australian watercolour', pg. 20-21, Heidelberg, Apr 1989, 20, 21 (colour illus.). 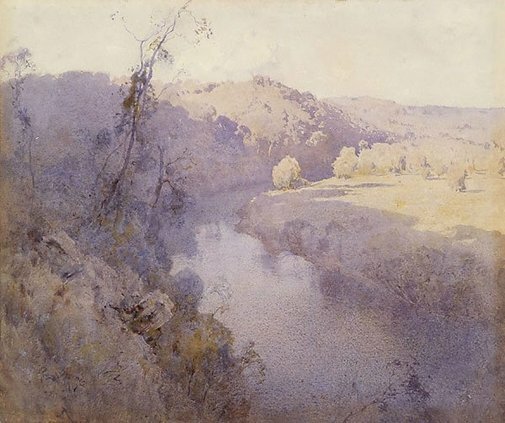 Australian watercolour painters: 1780 to the present day , 'The twentieth century to 1914', pg. 92-109, Sydney, 1989, 101 (colour illus.). Australian arcady: Landscape paintings from the Art Gallery of New South Wales collection , Sydney, 1983. cat.no. 22 Note no pagination, text reference only. Australian watercolour painters 1780-1980 , Adelaide, 1983, 205 (colour illus. ).